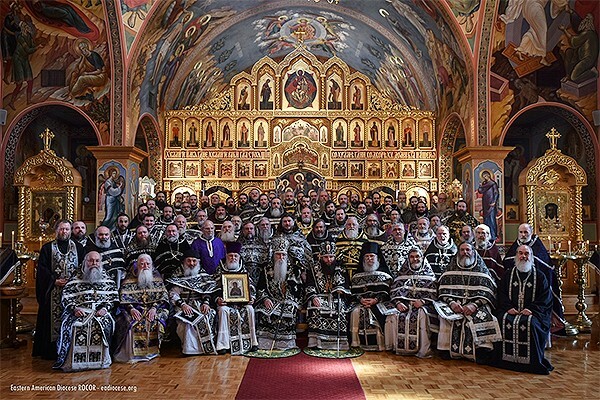 With the blessing of His Eminence, Metropolitan Hilarion, First Hierarch of the Russian Church Abroad, with the participation of Their Graces, Bishops George of Mayfield and Nicholas of Manhattan, and under the grace-filled protection of the myrrh-streaming Icon of the Most Holy Mother of God "Softener of Evil Hearts," the clergy and their spouses of the Eastern American Diocese of the Russian Church Abroad and the Moscow Patriarchate have gathered at St. Alexander Nevsky Diocesan Cathedral in Howell, New Jersey. Having heard many spiritual words and having in fellowship joined in common prayer, they with one voice call the faithful to unite in a concord of prayer and call to mind the common struggle to attain unto the Glorious Resurrection of Christ and fulfill the words of the Divine Savior to bring forth much spiritual fruit. As with all Orthodox Christians, our hearts are broken seeing the unspeakable distress among our Orthodox brethren in the God-preserved Ukraine, the Mother of Holy Rus’. We see the imminent danger that threatens not only the Ukraine, but the Orthodox Church as a whole. Realizing the demonic nature of these spiritual struggles, we call upon all of God’s chosen flock to strengthen their prayers and Lenten efforts of fasting and almsgiving, imploring the All-Merciful Savior to ease the suffering and alleviate the sorrows of the Ukrainian Orthodox people. This, being the Jubilee Year of St. Vladimir the Enlightener, we trust in his fatherly guidance in bringing peace to all of his descendants and unite them in the firm confession of the Orthodox Faith. Turning to the prayers of the wonderworker and Intercessor of the entire Russian Diaspora, our beloved St. John of Shanghai & San Francisco, we entrust our future and that of the world into the benevolent hands of Christ our True God. We entreat all of our faithful children to earnestly increase their prayers, both privately and in the parishes, to our great hierarch, who fearlessly defended the defenseless and nourished the fainthearted, to bring an end to fratricide and conflict, bringing to naught the attacks of the enemy of our salvation. Commemorating the remembrance of our dear Metropolitan Laurus and the anniversary of his blessed repose, we have served a panihida in his memory and have the conviction that his piety and the salvific struggle have found favor with the Lord. We humbly seek his guidance as a holy hierarch who undoubtedly in the future life beseeches the Lord on our behalf. Lastly, understanding the vital need to nourish our youth, we call upon pastors, families, and parishes to increase their ardent support of liturgical life, activities, and involvement of young people, ensuring the future health of the Church. It is an obvious fact that, if we do not energetically begin making our work with the youth a primary focus, there will be a seriously diminished likelihood of a future Church filled with vitality. This focus must begin in the home with the upbringing of children nourished with prayer, the Word of God and the lives of the saints, as well as the encouragement of parish priests in the establishment of Sunday schools and youth discussion groups. Also of primary importance are activities such as the annual St. Herman Youth Conferences, summer camps, and pilgrimages. These must not be merely declarations from the clergy and parents, but personal and heartfelt interaction and encouragement. This process of the churching of future generations must begin today. With sorrow we observe the moral decline of the world and remind our faithful of the necessity to remain firm and reject these soul-destroying elements. Our Russian Church Abroad has always held an unwavering position in upholding the ancient teachings of morality and chastity and call upon all Christians to likewise be stalwarts of the traditional understandings of a moral life. With deep concern we ask prayers for our First Hierarch, Metropolitan Hilarion, as he continues to regain his health and will lead the Russian Church Abroad in Her bold confession of our Faith. Asking the prayers of the entire Diocese, the faithful people of God and the clergy, we wish for each Orthodox Christian the inexpressible and boundless mercy of our Savior and hope in His mercy to worthily complete the remaining time of the Fast and to behold the brilliant and grace-filled Pascha of the Lord!